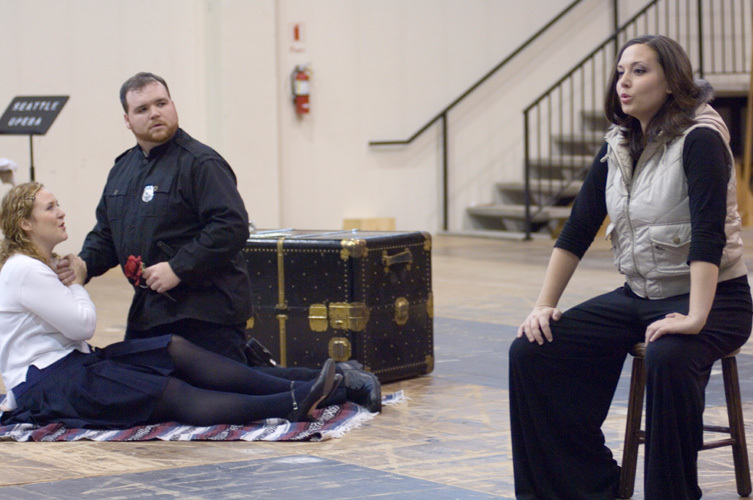 Before we hear our Friday night cast sing their first performance of Carmen this evening, let’s chat with the Micaëla, Caitlin Lynch, like our Escamillo Michael Todd Simpson a proud graduate of Seattle Opera’s Young Artists Program. 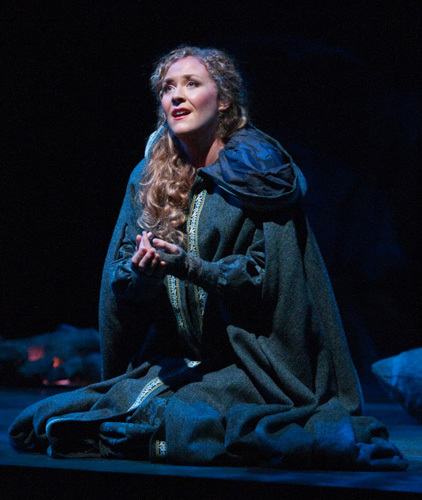 Caitlin (photo right by Elise Bakketun) is in the unusual situation of making her mainstage debut at Seattle Opera in a role she also sang as a Young Artist. Caitlin, the last time Seattle Opera heard you, we were doing Falstaff in the Young Artists Program, you were singing Alice, and a young baritone named Jonathan Lasch was one of our Fords. Please fill us in on what’s happened since then! Well, Jonathan Lasch and I met here, our romance sparked as we got to watch each other perform—we were in different casts—and we kept in touch, and we got married last December. Have you performed together since? Yes, we were at Glimmerglass together, and then the two of us were Donna Anna and Leporello with Michigan Opera Theater in Detroit. 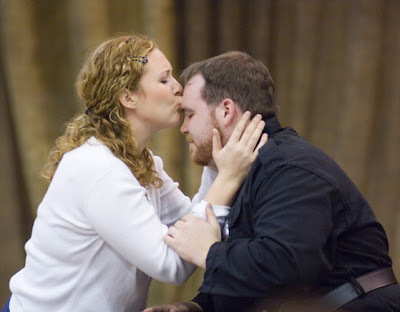 In fact he proposed after that final performance of Don Giovanni. We just bought our first house, in Ypsilanti, Michigan...Jonathan is working on a doctorate of music at the University of Michigan in Ann Arbor. He’s a busy, busy boy...he’s actually singing Falstaff in Falstaff now at U of M, and sang Ford again this summer at Aspen, so he’s been bouncing back and forth between Ford and Falstaff. But you haven’t yet played unhappy soprano wife and jealous baritone husband, or had occasion to murder each other onstage, or something like that? Not yet. Still to come, I hope! Upon returning to Seattle after five years, do you find it has changed dramatically? It was amazing, it was as if I never left. I can see all the differences, but the feel of the city is what I remember, what I love so much. I don’t have a car so I walk while I’m here...giving my legs a good workout walking up Capitol Hill. I hope to get in a couple of hikes. When you were a Young Artist, our touring show that fall was The Tragedy of Carmen. Right, Peter Brook’s adaptation of Carmen, just an hour and a half, and only six performers. And very intense. I was just thinking about that the other night. 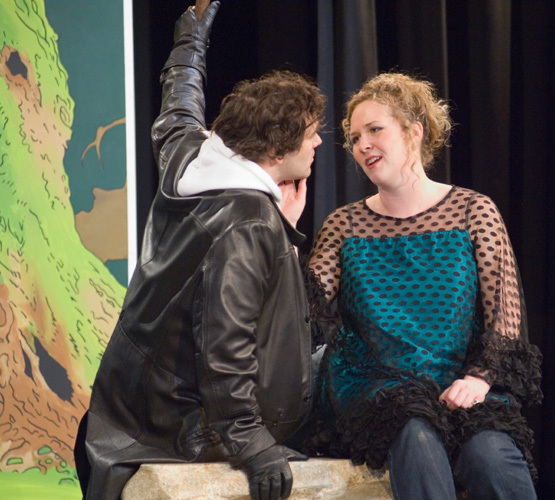 That was the first time I ever sang the role of Micaëla. And it was in English. That’s right, I remember, we used the translation by Sheldon Harnick, who wrote Fiddler on the Roof. What do you remember most about that production? I remember there was a scene about a mango. And Anya Matanovic’s speaking role remains in my memory—androgynous and heavily accented. I thought it was great, I loved doing the tour and we had some great audiences. It was an amazing year—we had so much fun. My first big Young Artists Program, and I’m still in some touch with all those Young Artists, just a really really great group of people. Have you sung Micaëla since then? Once, in Princeton, New Jersey, with Bernard Uzan directing. And that time I sang it in French. ...oh, yes. Bernard understands the language in a way that only a native speaker can. And in rehearsal a couple of weeks ago he confessed to us, he’s still learning things about Carmen. He’s directed it many, many times, he knows it in and out, but he’s still making discoveries. Have you worked with him on other shows? Yes, we did Così in Charlotte, NC. My third Fiordiligi. I’m up for anything, but I appreciate a true telling of the story. It’s direct and the music is able to speak so beautifully. The big dance number that starts Act Two is my favorite part--the dancers are so fantastic, and Carmen is really shining. Let’s talk about your character, who’s often plays good girl to Carmen’s naughty girl. 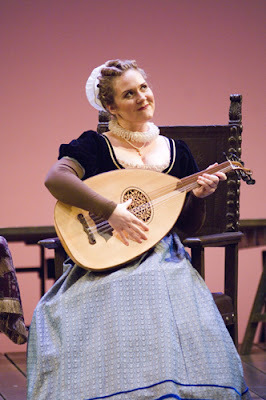 There’s a funny line from George Bernard Shaw, who wrote that “The success of Bizet’s opera is altogether due to the attraction, such as it is, of seeing a pretty and respectable middle-class young lady, expensively dressed, harmlessly pretending to be a wicked person.” Would you agree or disagree? I disagree. I don’t know that she’s wicked, or even pretending to be wicked. There’s so much more to it than that. And is there more to Micaëla than just a foil for Carmen? Yes, I think Micaëla is insanely courageous. She’s not just this sweet little country girl. For lack of a better word, she’s got balls. To travel the distance she travels, to stand up to Carmen, by going in Act Three to get José to come home to his dying mother. I don’t think that’s it. In her aria, Micaëla says Carmen is beautiful and dangerous. But she doesn’t say she’s evil. It’s more that José’s change of character, because of his relationship with Carmen, that’s what frightens or devastates Micaëla. Not so much Carmen herself. I think there’s a competition, you know, “I don’t look like that, I don’t dance like that, I don’t dress like that...I don’t do the things that Carmen does.” But she still has a very different kind of courage. Micaëla’s is based on faith in God, and maybe Carmen’s is based more on her Tarot cards. Do you ever wish you could play Carmen? I was thinking the other night, watching Act Two, “God, I wish I could be part of this scene!” So fun! No, I’m usually trapped or imprisoned. Yes, I just played Konstanze in Abduction from the Seraglio. I play tough women! But not dangerous tough. Of course, we always wish we could do what we don’t get to do—the grass is always greener. But I’m pretty happy with the roles I get to sing. The voice I have goes with the roles and music I’m drawn to. The truth is, if I were in Act Two, I wouldn’t get to watch it, and I really like to watch it. Caitlin played her role in Caitlin beautifully. I wish that she would've received a bigger role earlier in her career. Performing like she did I would have given her a free ride in my Seattle Town Car Service.